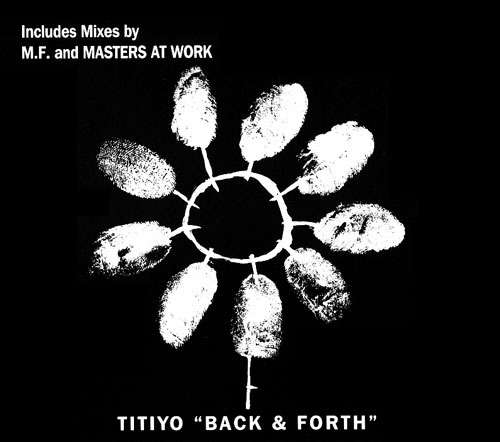 I suspect that the release of Titiyo's album "This Is" in the 'States in 1993 was partly due to the success of her previous one, and partly because she just happens to be Neneh Cherry's baby sister. With such a sniggersome artist name and unfortunate double-entendre single title, it's no wonder that Back & Forth didn't really make its mark in England, however it did include a couple of remixes from young upstarts Masters At Work (as did the follow-up single Tell Me I'm Not Dreaming). Both were undiscovered classics for me until a few years ago. Both show MAW at their inventive best at the beginning of the nineties (yes, again). or an iPod-friendly AAC file here (20MB). nice blog....just would like to know if it will be possible to upload the 2 originals mix at 320..